The book begins: Their banshee wails reached through my dreams and dragged me back . . . For the past two years, these coyotes had taken to howling nights at the edges of our property, just as major events were about to unfold. This call of the coyotes turns out to be a signal that Karen Shanley’s journey with her dogs is coming full circle. She is about to be offered a chance at redemption, with one condition: She has to find a way to recapture her faith in life itself. Karen Shanley’s lyrical story will have you laughing, crying, and nodding your head in understanding. Library Journal: A beautiful story, beautifully told. Recommended. —Jeffrey Moussaieff Masson, author of When Elephants Weep, and Dogs Never Lie About Love. —Suzanne Clothier, world-renowned dog trainer and author of Bones Would Rain From the Sky: Deepening Our Relationships with Dogs. — Marc Bekoff, Ph.D., editor of The Encyclopedia of Animal Behavior and author of Minding Animals: Awareness, Emotions, and Heart and The Ten Trusts: What We Must Do to Care for the Animals We Love (with Jane Goodall). —Marty Becker, D.V.M., resident veterinarian on ABC TV’s Good Morning America and co-author of Chicken Soup for the Pet Lover’s Soul, and The Healing Power of Pets. 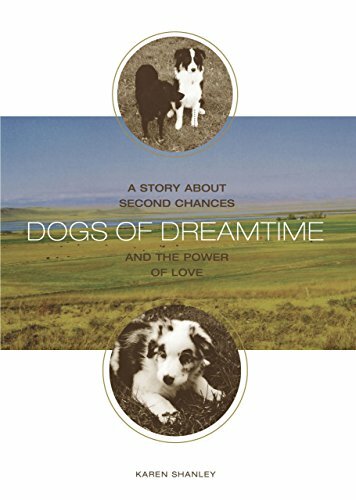 Dogs of Dreamtime is the story of one woman’s deep connection with her three very different dogs, and the extraordinary emotional journey they embark on together. Ultimately, it’s about how the unexpected events in our lives shape who we are and who we will become.